It's safe to say that Buttercup is not the song I was expecting when I walked out of Quonset Hut in Akron with my fresh, new copy of Shame by this new band with Stone Gossard from Pearl Jam. Shawn Smith's soulful piano and vocals took the lead, leaving me to remark, "Hey, this doesn't sound like Pearl Jam." And of course, it doesn't. "We came up with something that sounded so different than what any of us or other people expected from something I was associated with." Putting this disc back into my player drives me back to a time when Stone just strutted in place on stage, nodding happily to the cool, blues/jazz/funk/R&B ... y'know what, Brad can't really be nailed down that easily. Though Stone may have been the major draw to this band in 1993 (not to discount Satchel fans, but they just weren't the numerous back then) he often plays a supporting role for Shawn Smith's vocals and piano (Buttercup and Screen) or to Toback's bass like in 20th Century, which marks a turn in the album to even more blues and soul inspired songs like Good News and Bad for the Soul. When he does take the spotlight, like in the sweeping riffs of Nadine, it might be hard to flesh out. Down and Rockstar stretch the band even further with obvious influences by Alice In Chains. You'll have trouble keeping pictures of Layne Staley out of your head while Smith groans the word "down" in a spiral of emotion. Today Brad is easily a fan-favorite side project likely due more to Shawn Smith's prolific recording career and honey-sweet voice than any particular songwriting or guitar prowess on Stone's part. Fans who will surely flock to own the crisp remaster of the album wrapped in Regan Hagar's new art concept (the original artwork is preserved inside the blindingly neon packaging) or to own the album on vinyl which has long been out of print. 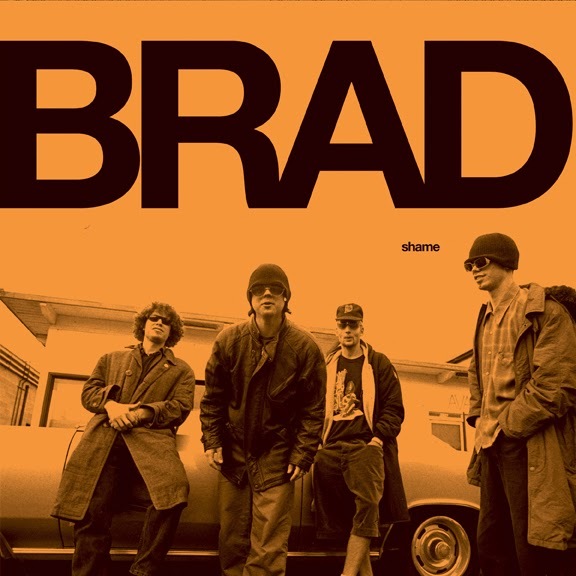 Brad's reissue of Shame is available in CD, vinyl, or through iTunes. T-shirts and reissues of Interiors and Welcome to Discovery Park are also available at MerchNow.